English Origins: The Bell surname arose independtly from several different sources. In some instances, it comes from the Old English word "belle" meaning "bell," and was most likely an occupational name for a bell ringer. It may have also been a name for someone who lived near a belll. bell is also known to have arisen from the English and Scots given name Bel, which derived from the Old French "beu" or "bel," meaning "handsome." Spelling variations include: Bell, Belle and others. Some of the first settlers of this name or some of its variants were: George Bell, who came to Virginia in 1638; James Bell, who settled in the Barbados in 1635; John Bell who settled in Virginia in 1638; Alexander Bell who settled in Virginia in 1654. 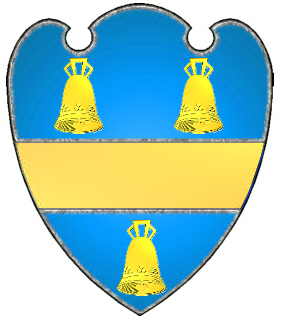 Coat of Arms: Blue shield with a gold stripe between three gold bells. 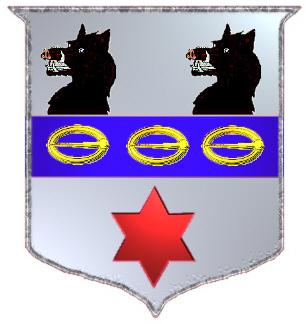 Coat of Arms: Silver shield, a blue horizontal stripe with three gold buckles, two black boar's heads above and a red star below. The surname Bell was first used by the people of ancient French region of Gascogne. It was a name for a person distinguished by great physical beauty. Interestingly, the name bell was originally derived from the Old French words la belle, which means beautiful. Spelling variations include: Lebel, LeBel, LaBelle, Belle, Bell, Labelle, Label, LaBell, LaBel, LeBelle, LeBaile, LaBaile, Lebaile and many more. First found in Gascogne where they were anciently seated in the honour of the seigneurie of De Labels, a village in the Basses-Pyrénées in the arrondissement of de Mauléon. Some of the first settlers of this name or some of its variants were: Nicolas Lebel who arrived in Quebec from Normandy in 1657; Pierre Lebel arrived in Quebec from Ile-de-France in 1724; Guillaume LaBelle arrived in Quebec from Normandy in 1671. BELL. 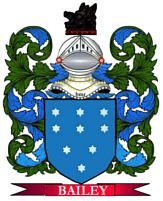 The BELL-UK mailing list is for the discussion and sharing of information regarding the Bell surname and variations (e.g., Belle, Beal, Beale) in the United Kingdom. To subscribe send "subscribe" to bell-uk-l-request@rootsweb.com (mail mode) or bell-uk-d-request@rootsweb.com (digest mode). BELL. The BELL-DNA mailing list is for the discussion and sharing of information regarding DNA testing and DNA projects for Bell descendants. To subscribe send "subscribe" to bell-dna-l-request@rootsweb.com (mail mode) or bell-dna-d-request@rootsweb.com (digest mode).